Traffic Signals are put up for the smooth running of traffic but in Belgaum some places those traffic signals have been put for over years but they never work. In some places where they work they have been put up wrongly but who will bell the cat. Take for instance the Traffic signal at Gogte Circle. 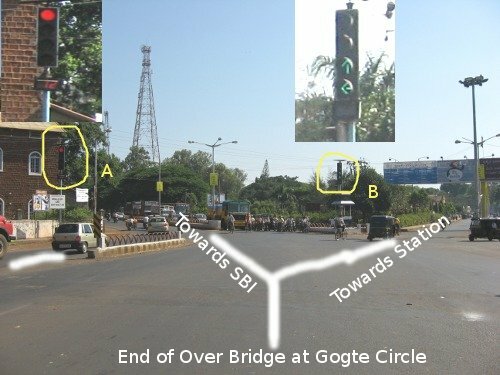 If one comes over from the Over bridge towards State Bank of India one can see TWO traffic signals (see image) A & B.
Anyways which is your Signal to follow A or B if you come over from Over bridge. If it works, it irks! Is this near the Railway station? (an earlier comment regarding names is causing confusion, will someone shed light on that please). This is a case of poor design/layout of the traffic signal. I hope the authorities read this and take corrective action. Also, this signal and many other such traffic intersections in the city are accident prone. I feel that bashing the traffic police for all the ills that plague us would serve no purpose. When will the citizens of our englightened city develop some traffic sense,civic sense and regard for others?. We have no business aspiring to glory as a city if we continue to behave as if in a jungle. We are beautifying this city externally by spening crores of rupees. This city will become really beautiful when everyone develops a sense of belonging, pride and concern for others. its basaveshwara circle not gogte circle……..
Goa ves is called Basaveshwara circle. Not just Basaveshwara, but Jagajyoti Basaveshwara circle. This is Gogte circle. Yes its very confusing… once the traffic police had caught me for breaking the signal… when..